I have been having a blast playing with lanyards lately. I made quite a few keychains in the DNA pattern with many different colors and I have made a couple different patriotic keychains as well as an American flag. Take a look. The flag isn’t perfect, as nothing really is in this world, but I like it anyway. The problem that I had was with the transition to the blue. I can change the colors in the DNA keychains no problem, but adding the blue to this flag was the most difficult thing I’ve ever tried to do. Someday I will try to make another one, but for now this will have to do. I really love the keychains though. 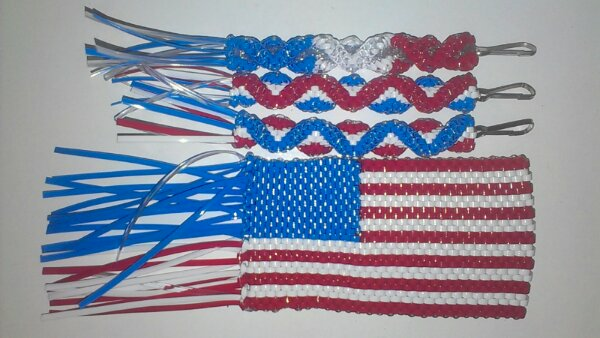 My motivation for making these patriotic lanyard projects is the 4th of July of course. I like to make something for every holiday. Actually, flag day is coming so this works for that day too. I think an American flag works for many holidays throughout the year. Anyway, I hope it’s pleasing. I plan on making more of the keychains as soon as I get more hooks. I think people will like them. I hope anyway.